A 65-year-old male presented with decreased vision in the left eye of 15-day duration after having undergone an uneventful cataract surgery 10 months back. He had been previously treated with systemic steroids for recurrent uveitis postoperatively on three occasions in the same eye. B-scan ultrasonography showed multiple clumplike echoes suggestive of vitreous inflammation. Aqueous tap revealed Pseudomonas aeruginosa sensitive to ciprofloxacin. The patient was treated with intravitreal ciprofloxacin and vancomycin along with systemic ciprofloxacin with good clinical response. Even a virulent organism such as P.aeruginosa can present as a chronic uveitis, which, if missed, can lead to a delay in accurate diagnosis and appropriate management. Postoperative infection is a devastating complication of any surgery. Likewise, in the eye, any intraocular surgery can give rise to postoperative endophthalmitis with significant morbidity. The incidence worldwide is less than 0.1% for postcataract surgery endophthalmitis and 0.09% in India. Although the microbiological spectrum for postoperative endophthalmitis is varied, causative organisms for chronic endophthalmitis include coagulase-negative staphylococci, Propionibacterium acnes, Propionibacteriumarachnia, Corynebacteriums pp., Aspergillus spp., and so on. The causes for a chronic, low-grade infection or late presentation could include low inoculum levels and/or low pathogenicity combined with the innate ocular defenses against infection. Hence, an infection should always be ruled out before treating it as chronic uveitis. We report a case of delayed-onset postoperative endophthalmitis secondary to Pseudomonas aeruginosa, a virulent organism, which masqueraded as chronic uveitis. A 65-year-old male presented with decreased vision in the left eye of 15-day duration which was gradual in onset, progressive in nature, and associated with pain and redness. The patient had undergone an uneventful cataract surgery in another center, 10 months back, with good visual recovery. He had had similar episodes during the past 4-5 months and had been treated with steroids (topical and systemic) elsewhere for chronic uveitis. As his symptoms worsened with steroids this particular time, the patient was referred to us. He had lost vision in his right eye due to trauma 20 years back. On examination of the left eye, his vision was perception of hand movements. Anterior segment findings included circumcorneal congestion and mild corneal haziness with keratic precipitates and pigments over the endothelium. The anterior chamber showed cells and flare 2+. The pupil was irregular in shape and dilated. The posterior chamber intraocular lens (IOL) was in situ with pigment dispersion on the IOL and yellowish exudates behind it. 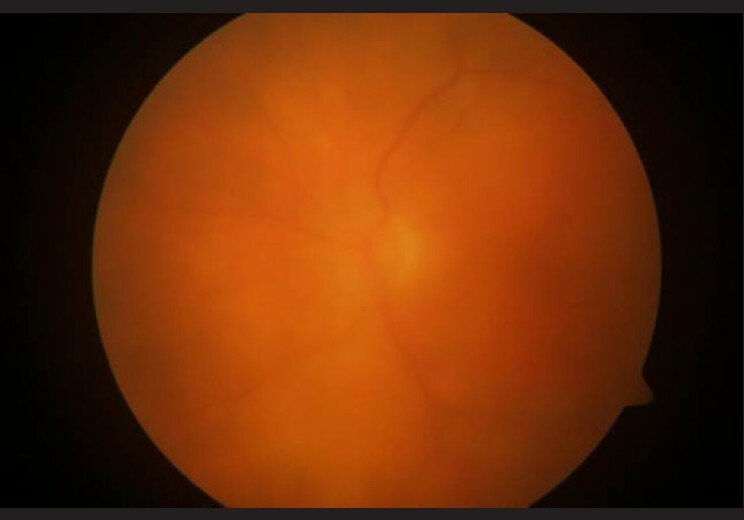 Details of the fundus were not visualized except for a yellow glow [Figure 1]. 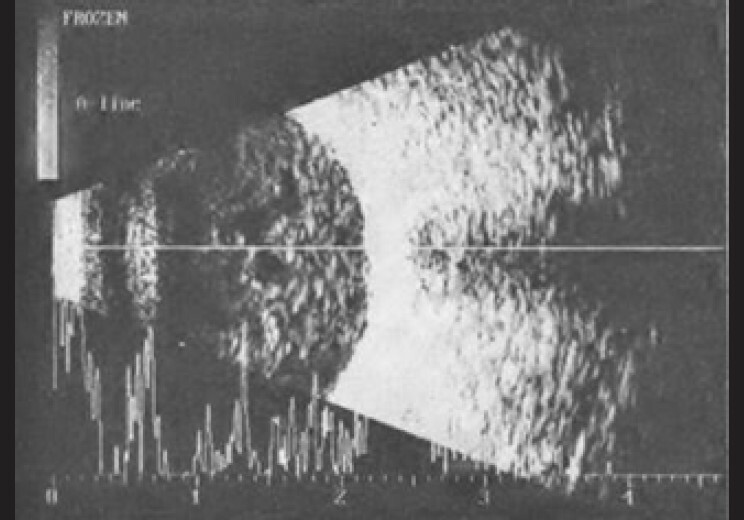 B-scan ultrasonography showed multiple dot like echoes with low to moderate reflectivity in the vitreous suggestive of inflammatory debris [Figure 2]. All other systemic investigations were normal except for a low hemoglobin level of 8mg/dL. An aqueous tap was done and subjected to potassium hydroxide (KOH), Gram stain, and culture/sensitivity, followed by intravitreal antibiotics (ceftazidime 2.25 mg/0.1 mL and vancomycin 1 mg/0.1 mL). Aqueous tap revealed P.aeruginosa sensitive to ciprofloxacin. The patient was then started on systemic (tablet 750 mg twice a day) and intravitreal ciprofloxacin (0.2 mg/0.1 mL). As there was clinical improvement with this treatment regimen, repeat intravitreal injections of ciprofloxacin and vancomycin were given on two occasions subsequently. Once the exudates cleared, the patient was restarted on systemic steroids with one dose of intravitreal dexamethasone (400 μg/0.1 mL). The patient improved symptomatically and on the last follow-up at two months, his vision was counting fingers at three meters. 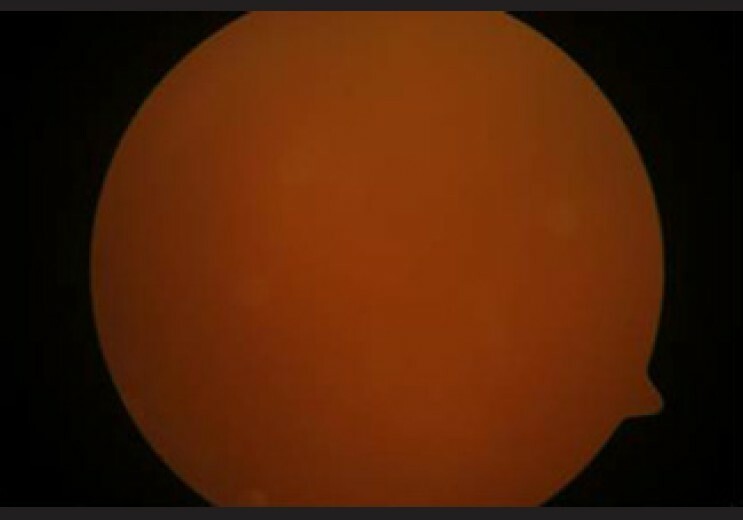 Examination of the fundus revealed clearing media with the disc and third-order blood vessels well seen [Figure 3]. Reports of the clinical use of intravitreal ciprofloxacin are limited. Our patient showed good response to the same with no adverse effects. One study has shown good availability of active drug when injected intravitreally either alone or in combination with vancomycin. It is also suggested to be a good alternative to ceftazidime and amikacin. In a 'one-eyed' patient, one has to consider the risk-benefit ratio of early surgical intervention for endophthalmitis. Patients more often than not need IOL explantation as well. Intravitreal ciprofloxacin is effective in treating late-onset postoperative endophthalmitis secondary to P.aeruginosa obviating the need for immediate surgical intervention. In conclusion, we report a unique case of chronic postoperative P.aeruginosa endophthalmitis that was initially diagnosed as chronic uveitis. Intravitreal and systemic ciprofloxacin therapy produced a good visual outcome. Ravindran RD, Venkatesh R, Chang DF, Sengupta S, Gyatsho J, Talwar B. Incidence of post-cataract endophthalmitis at Aravind Eye Hospital: Outcomes of more than 42,000 consecutive cases using standardized sterilization and prophylaxis protocols. J Cataract Refract Surg 2009;35:629-36. Sharma S. Ocular infections: Research in India. Indian J Med Microbiol 2010;28:91-4. Callegan MC, Engelbert M, Parke DW 2nd, Jett BD, Gilmore MS. Bacterial endophthalmitis: Epidemiology, therapeutics, and bacterium-host interactions. Clin Microbiol Rev 2002;15:111-24. Joe SG, Lim J, Lee JY, Yoon YH. Case report of Acremonium intraocular infection after cataract extraction. Korean J Ophthalmol 2010;24:119-22. Yu EN,Foster CS. Chronic postoperative endophthalmitis due to pseudomonas oryzihabitans. Am J Ophthalmol 2002;134:613-4. Jirásková N,Rozsíval P. Delayed-onset Pseudomonas stutzeri endophthalmitis after uncomplicated cataract surgery. J Cataract Refract Surg 1998;24:866-7. Lee DG, Urbach JM, Wu G, Liberati NT, Feinbaum RL, Miyata S, et al. Genomic analysis reveals that Pseudomonas aeruginosa virulence is combinatorial. Genome Biol 2006;7:R90. Hui M, Kwok AK, Pang CP, Cheung SW, Chan RC, Lam DS, et al. An in vitro study on the compatibility and precipitation of a combination of ciprofloxacin and vancomycin in human vitreous.Br J Ophthalmol 2004;88:218-22.